SIAL Group and Krista Exhibition collaborate on presenting the first SIAL INTERFOOD 2015. The event is held on 11-14 November 2015 at Jakarta International Expo, Kemayoran, Indonesia. "Interfood is already run annually for 14 years. This year we make innovation by collaborating with SIAL Group, the world’s largest food exhibition network with 50 years of experiences. SIAL Interfood is also collaborating with Saudi Arabia as a country partner,” said President Director Krista Media Daud Salim. 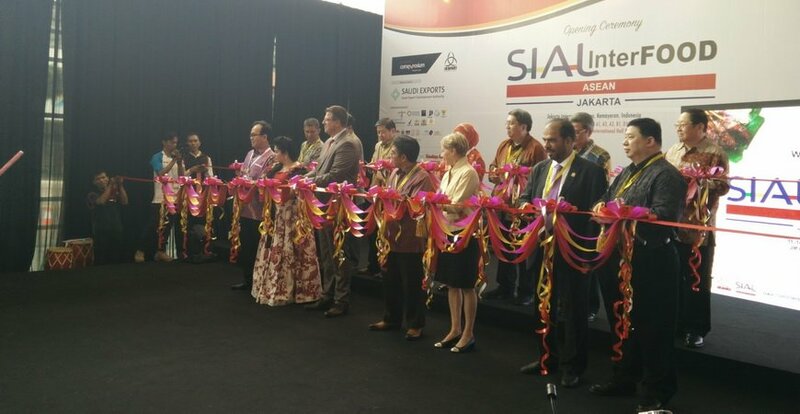 SIAL INTERFOOD 2015 is attended by more than 800 local and international companies from 22 countries. Various speakers will also present interesting seminars for food business enthusiasts such as seminar about "Kendala dan Peluang Pemasaran Jamu di Indonesia dan International by Dwi Ranny Pertiwi, " Jamu Branding" by representative of BPOM, and "Kiat Pengusaha Ritel dalam menghadapi MEA (Masyarakat Ekonomi ASEAN) by APRINDO. “South Asia is the most interesting region in the world for its fast development. It is indeed about business, but it is also about sharing and presenting our passion about food. We are connecting the local, regional, dan global market. You can find SIAL International in hall B3,” said Director of SIAL Group Nicolas Trentesaux. Coffee lovers and businesspersons can attend "Rahasia Kopi Ternyata Bukan Hanya Gaya Hidup” seminars by Eric Susandi and partners. There will be various coffee competitions such as Indonesia Barista Championship, Indonesia Latte Art Championship, Indonesia Brewers Cup, and Indonesia Cup Tasters Championship. For bar business owners, drinking enthusiast, and bartending practitioners, there will be Seminar of Wine and Spirit Blind Tasting Competition by ISA (Indonesia Sommelier Associations), Classic Bartending Competition, and Flair Bartending Competition. SIAL Interfood will also perform La Cuisine Cooking Demo. Some famous chefs such as Juna Rorimpandey, Vindex Tengker, Degan, Stefu Santoso, Henry Bloem, and Haryo Pramoe will demonstrate some delicious recipes. ICA (Indonesian Chefs Association) also held Jakarta Cooking Challenge while Krista Exhibition present Louis Le Saffre Cup, international bakery competition attended by several countries such as Indonesia, South Korea, Vietnam, Chine and Australia. SIAL Interfood is supported by Ministry of Industry of Indonesia, Ministry of Trade Indonesia, Ministry of Marine Affairs and Fisheries Republic of Indonesia, Ministry of Tourism and Creative Economy of Indonesia, Ministry of Cooperatives & Small & Medium Enterprises of Indonesia, and numbers of food business of associations in Indonesia.